This is a simple demonstration of the basic principals underlying the behavior of thin-walled pressure vessels (TWPVs). A balloon or balloons are used to show that hoop stresses are twice as high as longitudinal stresses in cylindrical pressure vessels. where the hoop stress is equal to the pressure times the inner radius divided by the wall thickness. The longitudinal stress is exactly half the hoop value. Further, according to Hooke’s Law, the strain will follow the stress, so observed deformations are indicators of the magnitude of stress. Party Balloons Lots! Both round and cylindrical. Spheres should be 10″ minimum diameter when inflated, and the cylindrical balloons should be about 5 times as long as they are around. Choose really big balloons for big lecture halls. Inflation Device 1 We use a Super Soaker filled with air rather than water. Either way, the device needs to be able to fill the balloon rapidly to avoid “dead air”. Marker/Pen 1 You’ll have to experiment with this somewhat to get a clear, dark mark without having the carrier of the ink weaken the balloon. Before Class: Prepare the balloons by drawing a square stress block midway down the length to negate the effects of the ends. Be careful drawing the square; ensure the sides are equal with 90o corners and the lines are very bold. If the lines are not dark enough, they will be very hard to see after the balloon is inflated because they fade when they stretch. Regular ball-point ink pens work well for drawing the stress block. Definitely test this out a few times before going into the classroom to make sure the marks and the inflation device won’t fail you when it counts. In Class: We typically have fun with the demonstration and play up the inherent party nature of balloons. Several pre-marked, deflated balloons of each type are displayed at the start of class. We show the students the square stress blocks on the deflated balloon and ask the students what shape the square will be after the balloon is inflated for each balloon type. Will the sides be the same length? The corners still 90o? The balloons are then inflated and the behavior is observed. 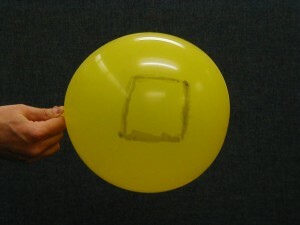 Observations: The students should observe that on a spherical balloon, the stress block remains square, with 90o corners. This demonstrates that the magnitude of the stress in both the longitudinal (along the length of the balloon) direction and the hoop (around the circumference) direction are the same. On the cylindrical balloon, the students should observe that the initially square stress block has deformed into a rectangle, with the longitudinal deformation being half as great as in the hoop direction. This demonstrates that the magnitude of the hoop stress is twice that of the longitudinal stress. For both balloons, the persistence of 90o corners demonstrates that there is no shear stress acting on the stress block. The lack of any shear deformation shows that the stress blocks are oriented along the principal stress directions in both cases. We sometimes ask student volunteers to blow up the balloons, having purchased balloons that were difficult to inflate. The students have always succeeded in blowing up the balloons, although usually only after multiple attempts. Do not choose students who smoke or have lung ailments for this part of the demonstration, as they may injure themselves trying to inflate the balloons. Next, we ask the students if they’d like to see us blow up the balloon. 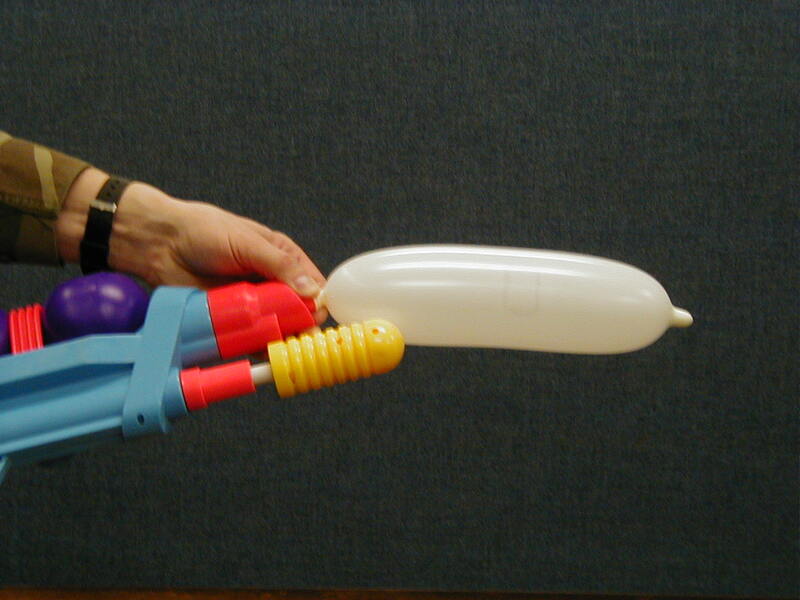 The students are usually quite eager to see what shade of red the instructor’s face will turn during the attempt, but are surprised when the instructor produces a hidden Super Soaker water gun fully charged with air and easily inflates the balloon. Two embedded lessons within this demonstration are the spherical pressure vessels on the Super Soaker (why did they choose spheres?) and the fact that pre-yielding the latex balloons by stretching significantly weakens them and allows for easy inflation. Led Klosky (2014), "Balloons!! : A demonstration of thin-walled pressure vessels," https://www.handsonmechanics.org/mechanics-of-materials/34.